San Francisco has one. So does Philadelphia. The same with Portland, Baltimore and sunny San Diego. 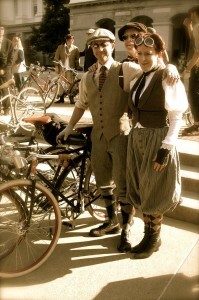 Thanks to the efforts of Rick and Erin Houston, Sacramento finally has its own tweed-themed cycling event. 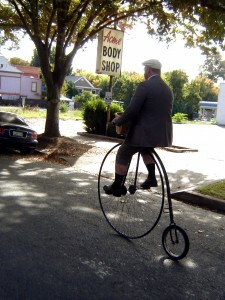 Yet despite the emphasis on riding in dashing attire, Sacramento’s Tweed Ride has less to do with fashion than it does with encouraging camaraderie within Sacramento’s bicycling community. Rick Houston, an avid cyclist since he was a teenager, discovered the tweed riding phenomenon through a fellow named Mike Flanigan, who runs Alternative Needs Transportation (or A.N.T. ), a small bicycle shop in Boston, and organizer of Bean Town’s first tweed ride. The Houstons contacted Rick Mahan, owner of One Speed Pizza and cycling enthusiast, and Brad Gleed, one of the original organizers of the annual Sacramento Appetite Enhancement Thanksgiving Day Ride. Gleed assisted with providing event organizing input, suggesting routes and rest breaks, and the ride’s duration. Mahan graciously opened the doors of One Speed to the event. For all intents and purposes, the first official Sacramento Tweed Ride, which took place on November 7th, 2009, was a smashing success. So much so, in fact, that it nearly overwhelmed its organizers. “I was expecting to have a little coffee in the morning with 15 or 20 people,” Rick explains. The turnout on that sunny Sunday morning was closer to 80. The tour, which started around 11AM at the Sacramento Bicycle Kitchen, wound through The City of Trees with stops at the State Capitol, One Speed, The Bonn Lair pub, Revolution Wines, Hot Italian, ending around 6PM with groups splintering off to The Rubicon and The Shady Lady. The smaller New Year’s Day ride featured 50 cyclists braving rainy conditions, but having a great time nonetheless. 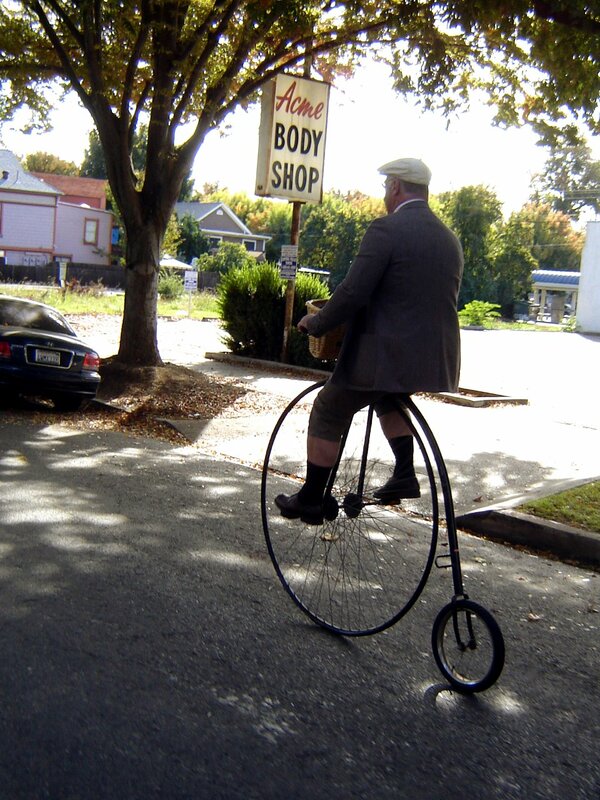 The Sac Tweed Ride’s blogspot manifesto echoes this sentiment, favoring casual group riding in “plus fours” atop lugged steel steeds over lycra-clad speed racers straddling expensive carbon fiber machines. “I think the costumes are a good way to attract people who might not necessarily think of going on a group ride,” Erin adds. 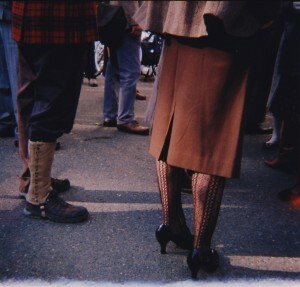 During both Tweed Rides, camaraderie trumped any pretentious behavior that normally plagues other group cycling events; it’s very difficult to be obnoxious while wearing turn-of-the-century bicycling outfits. The next Sac Tweed Ride will take place Sunday, March 28th, at 10:30AM starting at The Bike Kitchen. There will be a new route, new stops, and vendors such as B. Spoke Tailor will be on hand. Among the more substantial giveaways are two bicycles donated by The Bicycle Business. The Houstons also hope to drum up support for the woefully underfunded state advocacy group, the California Bicycle Coalition. 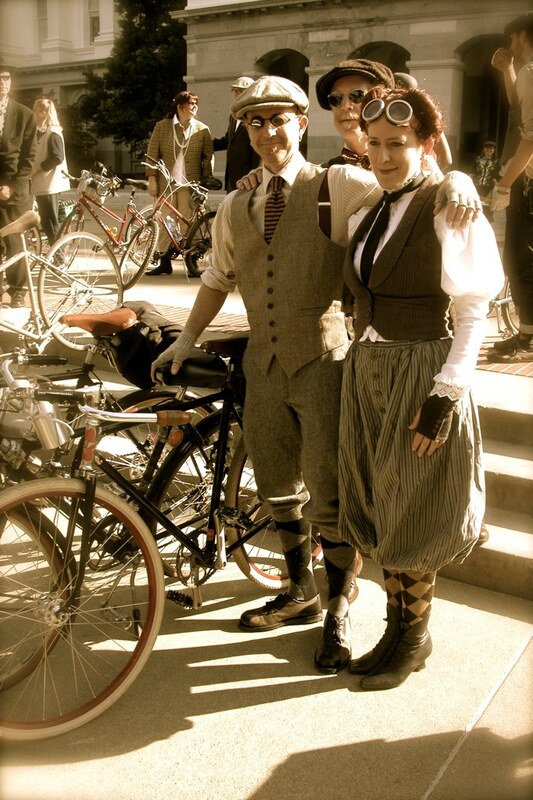 Above all, The Houstons want to encourage the communal aspect of Sacramento’s tweed ride. “That’s really what it’s all about,” Rick says, smiling. 80-plus cyclists decked-out in their finest tweeds couldn’t agree more.